A few weeks ago, I found the Alvin Penstix at my University Bookstore. I've heard good things about Alvin products, so I was excited to take this pen for a spin. While I do not typically create graphics or technical drawings, I am certainly interested in "all fine writing." 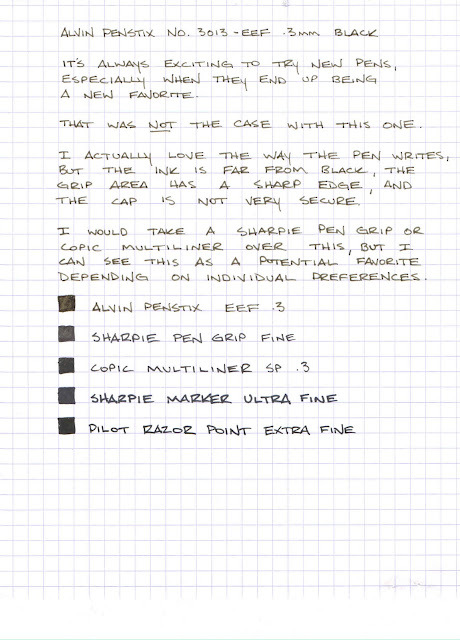 As you can see from the writing sample, I was not a huge fan of this pen. It is not very comfortable to hold, and the ink is more of a grey-brown than black, so that, too, was very disappointing. The color of the scan was not entirely accurate on how dark the inks were, but the color of the Alvin Penstix is pretty close to how I see it in person. Outside of those two points, the cap takes very little energy to be removed, so I can see this pen ruining some clothes. The clip is not on the cap (it is on the back of the barrel), so this pen would be point down in your shirt or pants pocket. If the cap falls off, which it will, there will be ink all over the place. The one thing I can say about this pen is that I really did enjoy the way the point puts ink on the paper - it was fun to use in that respect, but otherwise there is little I can say to salvage the overall writing experience. See what I mean about the edges? There two edges that are not great to hold after a few minutes. The tip is one of those white plastic tips that feels like a firm felt-tip marker. I will be sending this pen off to The Pen Addict to see what he says about it, but I don't recommend purchasing one. Interesting... I love the color and flow of the ink. Although it does start to cramp your hand after awhile... Perhaps go with a larger tip? Also, I don't know how they crammed so much ink into it - keeps going and going.